Kashmir issue is a widely contested issue between India and Pakistan. 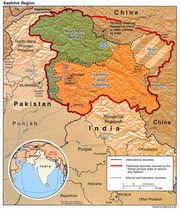 Ever since the country was partitioned on a narrow sectarian out look of Two-nation theory in 1947 and emergence of two independent sovereign states the erstwhile princely state of Jammu and Kashmir has become a bone of contention among claims and counter claims by different groups and political shades. In the process the worst hit has been the facts. Every one is interpreting and reproducing basic facts according to their convenience. Continued abuse of facts has resulted in creation of certain myths that are now being circulated as facts. It is to clear the dust and reproduce these facts as they are that we are undertaking this exercise. One of the very basic distortions about the issue of J&K is that Kashmir means Jammu & Kashmir. This is a deliberate attempt to mislead public opinion. The total area of Jammu Kashmir as it existed on and before 15th August 1947 is 2,22,336 Sq.Km. Pakistan Occupied an area of 83,294 sq. Kms. ( 37.4%) in 1947. out of which it gifted 5180 Sq. Kms to China in 1963. Kashmir province is just 15.63% of the part of the state that is under administrative control of India. Out of the total area of 1,01,387 Sq. Kms. (45.62%) Ladakh Division comprises of 59241 Sq.Kms. ( 26.65% of original state & 58.43% of state remaining with India) ;Jammu Division is 26293 Sq. Kms. (11.83% of actual state & 25.93% of Indian administered parts); while Kashmir Province is only 15853 Sq. Kms. That is 7.13% of original state and 15.63% of the state at present with India. Therefore the Kashmir is just a small province of Jammu and Kashmir. Myth No 2 : Jammu and Kashmir Acceded to India but did not merge with it, thus making the accession conditional. Nothing can be farther from the truth than this atrocious statement. Fact is that the state of Jammu and Kashmir acceded to the dominion of India in pretty much the same manner as did any other Princely state. Ruler of the state, the only legally authorized person to sign the Instrument of Accession signed absolutely the same instrument deed as was signed by about 600 other rulers of native states. This was done according to the legal requirements necessitated under Indian Independence Act 1947 of the British Parliament. Signature on the deed of Accession and subsequent acceptance of the same by Governor General was the only way to make these states as an integral part of the country. As far as merger issue is concerned, it is a deliberate attempt to confuse people. No other Princely state, repeat none merged with Indian dominion after Acceding. There was no instrument of merger on the pattern of Instrument of Accession. Yes certain tiny native states merged together to form a viable administrative unit in the independent India. But this merger amongst them had no affect on the overall integrity of the country. J&K was the largest state and hence administratively viable so there was no need to merge it with others or vice versa. Myth No 3: Under partition plan and two-nation theory Muslim majority J&K should have gone to Pakistan. This is absolute non sense. Two nation theory was applicable to British India only. Native states were not to be divided. The rulers of these states were authorized to join either of the two dominions. Myth No 4: Kashmir has never been a Part of India. Again a willful distortion. Jammu and Kashmir behaved exactly in the same manner as did any other part of the nation. India as we understand it today was not always under one political regime. One or the other part of the country was under separate political rulers. But it continued to be a sigle nation.Jammu akshmir was no different. Myth No 5: India promised right of self determination to people of Kashmir. India did not promise any plebiscite under the instrument of accession. There was neither any need nor the scope for such a promise. Neither cabinet meeting nor any other government of India decision making body decided to give a promise of any such kind to any native state. Myth No 6 : People of J&K are up against India. Fact is that people of J&K are as much Indian as are the people from any other state. It is only a small section of population provoked by Pakistan and pampered by New Delhi that is creating the impression. The fact that Pakistan is sponsoring separatist tendency in Kashmir valley using religion as a toll and in fact militarizing the discontent is a well known fact, established by even the official documents of the government of Pakistan and its rulers. Myth No 8: India is Holding Kashmir by mere force. That simply is not possible. No country can retain any territory by force. It is the common past and a common future that binds the people of this country from Kashmir to Kanyakumari. Kashmir is a proud symbol of ancient civilization and modern nationhood of India.